I don’t like writing about deficits and debt because I don’t want to deflect attention from the more important underlying problem of excessive government spending. Indeed, I constantly explain that spending is what diverts resources from the productive sector of the economy,regardless of whether outlays are financed by taxes or borrowing. This is why a spending cap is far and away the best rule for fiscal policy. That being said, red ink does matter when politicians incur so much debt that investors (i.e., the folks in the private sector who buy government debt) decide that a government no longer is trustworthy. And when that happens, interest rates climb because investors insist on getting a higher return to compensate for the risk of default. And if things really deteriorate, a government may default (i.e., no longer make promised payments) and investors obviously will refuse to lend any more money. That’s basically what happened in Greece. Sadly, most governments have not learned from Greece’s mistakes. Indeed, government debt in Europe is now significantly higher than it was before the 2008 recession. This suggests that there will be another fiscal crisis when the next recession occurs. 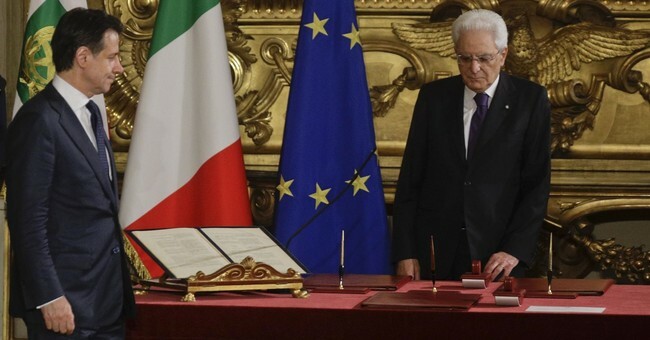 Italy presumably will be the big domino to fall, though there are many other nations in Europe that could get in trouble. But the problems of excessive spending and excessive debt are not limited to Europe. Or Japan. The World Bank has a new report that shows that red ink is a growing problem in the rest of the world. More specifically, the report is about “fiscal space,” which some see as a measure of budgetary flexibility but I interpret as an indicator of budgetary vulnerability. Here’s how it is defined in the report. …fiscal space is simply defined as the availability of budgetary resources to conduct effective fiscal policy. …some studies define it as the budgetary room to create and allocate funding for a certain purpose without threatening a sovereign’s financial position. …Debt service capacity is a critical component of fiscal space. It has multiple dimensions, including financing needs that are related to budget positions and debt rollover, access to liquid markets, resilience to changes in market valuations of debt, and the coverage of contingent liabilities. …Market participants’ perceptions of sovereign risk reflect and, in turn, influence an economy’s ability to tap markets and service its obligations. Thus, fiscal space can function as an essential instrument of macroeconomic risk management. And what is “effective fiscal policy”? From the World Bank’s misguided perspective, it’s the ability to engage in Keynesian spending. Countries with ample fiscal space can use stimulus measures more extensively. But let’s set aside that anti-empirical assertion. I found the report useful (though depressing) because it had data showing how debt levels have increased, especially in emerging market and developing economies (EMDEs). 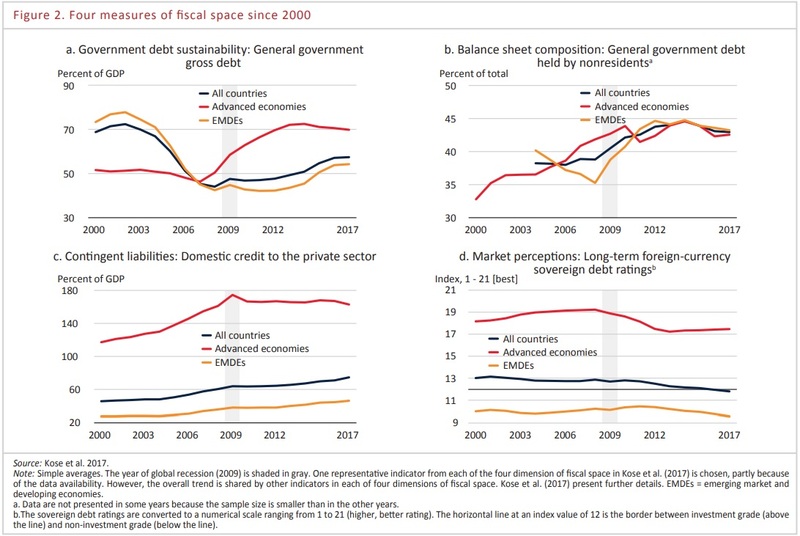 Fiscal space improved during 2000-07, but has shrunk around the world since the global financial crisis. …debt sustainability indicators, including government debt and fiscal sustainability gaps, have deteriorated in at least three-quarters of countries in the world. …and perceptions of market participants on sovereign credit risks have worsened. …Since 2011, fiscal space has shrunk in EMDEs. …fiscal deficits widened to 3 to 5 percent of GDP in 2016, on average… Government debt has risen to 54 percent of GDP, on average, in 2017. …EMDEs need to shore up fiscal positions to prevent sudden spikes in financing costs… Fiscal space has been shrinking in EMDEs since the global financial crisis. It needs to be strengthened. Here is a set of charts from the report, showing both developed nations (red lines) and developing nations (yellow lines). The top-left chart shows debt climbing for EMDEs and the bottom-right chart shows debt ratings dropping for EMDEs. The EMDEs have lower debt levels, but their debt is rated as more risky because poorer nations don’t have a very good track record of dealing with recessions and fiscal crises (would you lend money to Argentina?). In any event, the yellow lines in the top-left chart and bottom-right chart are both headed in the wrong directions. The bottom line? It won’t just be European welfare states that get in trouble when there’s another recession. By the way, the report from the World Bank offers some policy advice. Some of it potentially good. Pension reforms could…support fiscal credibility and generate long-term fiscal gains… credible and well-designed institutional mechanisms can help support fiscal discipline and strengthen fiscal space. …Fiscal rules impose numerical constraints on budgetary aggregates—debt, overall balance, expenditures. But most of it bad. Fiscal sustainability could be improved by increasing the efficiency of revenue collection… Measures to strengthen revenue collection could include broadening tax bases to remove loopholes for higher-income households or profitable corporates. In countries with high levels of informality, taxing the informal sector—for example, by promoting a change in payment methods to non-cash transaction and facilitating collective action by informal sector associations—could help raise revenues directly, as well as indirectly… In EMDEs, reforms to broaden revenue bases and strengthen tax administration can generate revenue gains. At the risk of stating the obvious, the problem in developing nations is bad government policy, not insufficient revenue in the hands of politicians. P.S. I included the caveat that some of the recommendations were “potentially good” since the report didn’t specify the type of pension reform or the type of fiscal rule. I like to think the authors were referring to personal retirement accounts and spending caps, but it’s not clear. P.P.S. The IMF subsidizes and encourages bad fiscal policy with bailouts. Fortunately, there is a much more sensible approach.